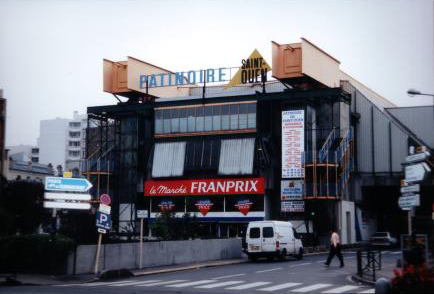 Indoors - Located just to the north of Paris city limits, in the town of St Ouen. The ice is well maintained, and medium hard. There are bumps on the ice from water dripping off the overhead ductwork. 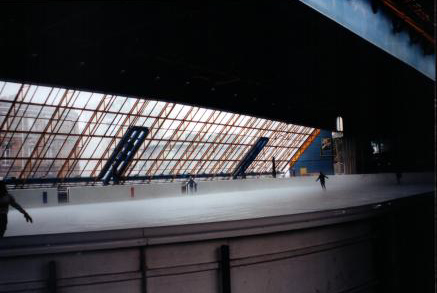 One side of the building is covered with glass and gives you a view of the skyline as you skate by. The music is OK but it's best to bring a walkman. We went to a weekday morning session which had a total of 8 skaters - mostly "regulars." The people were friendly and offered us guidance on other rinks and sessions. Take the metro line 13 (direction St-Denis-Universite) to Mairie de St Ouen (see map). There is a skating school if you want lessons. Skate rental (hockey and figure) is also available. There is a vending machine for drinks. There aren't any lockers but there is a coat check available. Most of the skaters left their stuff on the bleachers. 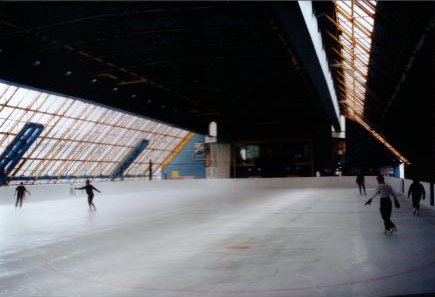 See the Patinoire de St Ouen web site for more information, including the schedule and prices. Last updated Feb 23, 2007.